So where did human beings come from? Are we here by chance… just an accident? Or are we here on purpose and for a reason? 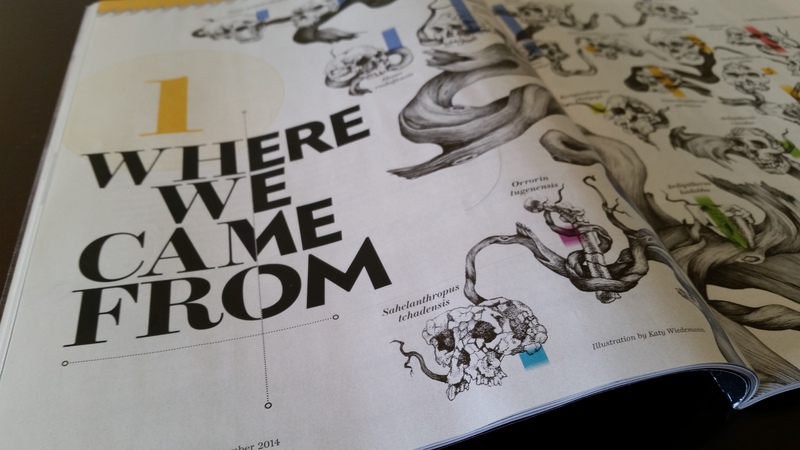 The September issue of Scientific American attempts to answer that question, however, it only offers one possibility… evolution. The article, assuming evolution, begins by explaining that the human family tree used to be a “scraggly thing,” with relatively few fossils to work with. And then an interesting admission is made: scientists assigned those fossils based on a “best guess.” That’s right. Evolution is presented to students in schools and colleges as fact, yet scientists admit they’re only offering their best guesses. Now this is hardly a secret. Those who attempt to understand evolution are already aware of this. But evolutionists have often used a bait-and-switch tactic, first appealing to this lack of certainty, and then act as if their theories are proven fact based upon “overwhelming” evidence. You see, a lack of certainty is a scientific phenomenon that we can’t escape. New information will often change the way we think about any particular scientific idea. But when there are competing theories, only one of them can be the dominant or prevailing scientific model accepted by mainstream scientists. Therefore, that lack of certainty transforms into certainty so as to capture as many supporters as possible. But the problem with this is that certainty isn’t a byproduct of the scientific method- it’s actually a byproduct of faith. So when evolutionists resort to certainty in their theories or hypothesis, they’re really admitting that their beliefs are based on faith. The writer, Bernard Wood (paleoanthropologist at George Washington University), goes on to explain that the new human family tree is much more “luxuriant,” but abounds with branches and twigs that eventually peter out. The tree is also described as “diverse”, and he says it paints a much more interesting picture of our origins, but makes it all the more challenging to sort out our ancestors from evolutionary dead ends. I actually enjoy examining the words writer’s use, and I try to understand why they used a particular word or phrase, and how that advances their narrative. A “luxuriant” family tree sounds wonderful, doesn’t it? It sounds rich and upscale, and even intellectual. It’s a great description that could potentially invite unwitting readers to agree that this new family tree is believable. Of course I wouldn’t describe this family tree as luxurious- I’d describe it as broken mess. But I do agree that the fossils collected thus far present quite a challenge to scientists wishing to erect a human family tree. Wood admits that the story of evolution is “far more complex” than anyone imagined. I agree with that statement too. It’s complex because it relies upon unprovable assumptions that I would argue are false. Believing in a false premise would understandably make things complex and messy. Further admissions explain how scientists once thought that the evolutionary history of humans was simple, beginning with Australopithecus to Homo erectus, to Neandertals, to us (Homo sapiens). But forty years of research has “completely shattered” their hypothesis. And now they believe that a variety of hominins walked the earth at different times, and it will take decades to figure out how they’re all related. Of course these scientists would never admit that their failed predictions have falsified this evolutionary tree and that perhaps humans didn’t evolve from an ape-like ancestor at all. No, instead of these surprises falsifying evolution, they tell us that it makes their endeavor more “challenging” and “fascinating”. Yet one of the core principles of the scientific method is the ability to falsify a hypothesis or theory. If, however, a theory cannot be falsified, then it’s not really science… and if one continues to believe it, then it becomes a religion based on faith. And that’s why so many people consider evolution to be a religion. Today scientists rely on molecular data, and the current paradigm suggests that the common ancestor we supposedly share with chimps lived about 5-8 million years ago. Nonetheless, the article explains how difficult it is to date some of the fossils. It turns out that many fossils in South Africa had washed into caves, along with soil, and that means that the fossils aren’t necessarily buried in any kind of chronological order that can be dated. But the fossils in East Africa are mainly found in layered sediments alongside riverbeds, with the oldest fossils buried at the lowest levels, and that allows for the age of some of the strata to be established. Even though modern humans roam the earth without competition, scientists believe that at least five other lineages shared the earth with humans within the last 100,000 years (ex. Neandertals, Denisovans, H. erectus, H. floresiensis). It’s interesting to think that, if these distinct lineages existed today, how would we interact? Mankind obviously doesn’t get along on a worldwide scale now, so, if we had to share the earth with other species of humans, one can only imagine how much worse the fighting would be. The article acknowledges critics who argue that paleoanthropologists may have misidentified new species in an attempt to attain fame and further funding, and I think those criticisms are valid. It’s quite possible that a number of the fossils could represent the same species, but were identified as another species for a variety of reasons. I would suggest that they’re all humans that lived at different times and places. Currently, scientists admittedly don’t know if a particular hominin is ancestral to humans or not, and the writer describes the evolutionary tree as a bundle of twigs, or a tangled bush. But I found it refreshing that he acknowledged his own prejudice, and says he thinks it most likely that the tangled bush is a real phenomenon. Next he considers what caused the extinction of all the other hominins, and suggests that climate changes would have been the most likely cause, as well as competition between species. He went on to admit that we don’t have genetic evidence for early hominins, and that any supposed lineage is “challenging” to decipher. He also hits on something else that creationists have been pointing out for years- namely, that just because certain organisms share a similar type of morphology (body type, such as jaws or teeth), doesn’t mean they share a common ancestor. It’s entirely possible that they share similar features because those features work well for the environment in which they live. Based on all this, why do we even need to consider that humans evolved from a non-human, ape-like ancestor? I think the evidence supports what creationists have been saying all along- that humans have always been humans, created in the image of God. While evolutionists continually have their theories falsified, creationists theories remain intact. Lol. Of course both positions are unobservable and untestable via the scientific method- depending on how each is defined. If it’s possible to reliably confirm the age of the earth and universe, then both creation and evolution can be observable and testable. But since we can’t, neither is observable or testable. And that’s why both positions should be placed on a level playing field. If both were treated fairly, I’d think education in America would benefit.